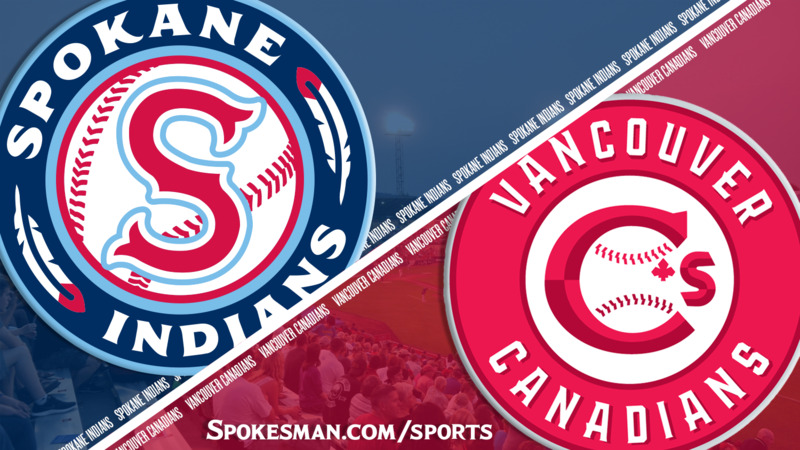 The Spokane Indians and Vancouver Canadians entered play on Saturday tied atop the North Division of the Northwest League at 20-15 with three games to play – against each other. Since the teams can’t finish the season tied, the three-game series at Avista Stadium essentially turned into a best-of-three playoff series, with the winner advancing to play first-half champ Everett – and the loser heading home. Indians starter Jake Latz turned in a tremendous performance, J.P. Martinez and Starling Joseph homered, and the Indians took the opener over the Canadians 6-0 to move one game ahead with two to play. “We’ll be ready to go from the first pitch (on Sunday) and I’m excited to see these guys play,” manager Kenny Holmberg said. “You wouldn’t really want it any other way,” Latz said. “That’s what baseball is about. Last series of the year, chance to get into the playoffs. Latz tossed 5 2/3 shutout innings, allowing one hit and three walks with 11 strikeouts. Of his 91 pitches, 58 were strikes. “I had all my pitches today,” Latz said. “Last start in Vancouver I was mostly fastball-changeup. They’re just a really aggressive lineup. “We stuck with our game plan today. Why change it? But the curveball was sharper today, so I was able to work that in the mix, too. Holmberg was effusive with praise for his starter. The Indians can clinch the second-half title on Sunday – with former MLB pitcher Alex “Chi Chi” Gonzalez on the hill on a rehab assignment. Gonzalez started his professional career in Spokane in 2013 as a first-round pick of the parent-club Texas Rangers. He underwent Tommy John surgery in July 2017. “It’s exciting and I’m happy to be here,” Gonzalez said. “The crowd’s going to be great, as it always has. Gonzalez is scheduled to throw up to five innings. Indians pitching coach Jono Armold said he’s looking forward to watching Gonzalez pitch. The Indians grabbed the lead in the third on Martinez’s opposite-field home run, his eighth homer of the season. “To do what J.P. did there, to drive a ball with two strikes to left center field is very impressive,” Holmberg said. Meanwhile, starter Latz was dealing. He struck out two in the second and two more in the fourth to bring his total to seven, then struck out the side in the fifth. With no outs in the bottom half, Joseph reached on a wild pitch and Hasuan Viera singled. With one down, Jax Biggers lined one into the left-center gap to plate both runners. Martinez followed with a single through the drawn-in infield to make it 4-0. The Canadians got their first base hit with one out in the sixth on a flare double down the right-field line by Otto Lopez. Latz struck out Griffin Conine, but issued back-to-back walks to load the bases and Holmberg came out with the hook. Cole Uvila entered and struck out Jake Brodt to escape the jam. Joseph added to the lead with a two-run homer, his 11th of the season, to make it 6-0 after six full. Season ends early: The Rangers shut down starters Seth Nordlin and Ryan Dease, and reliever Sean Chandler, because of organizational innings restrictions. Nordlin leads the NWL in strikeouts with 79 and went 4-1 with a 3.82 ERA. Dease went 5-4 with a 5.34 ERA and Chandler went 0-0 with three saves and a 1.27 ERA in 17 games. Pitcher Jesus Linarez was added to the staff for the last three games. Published: Sept. 1, 2018, 9:25 p.m. Updated: Sept. 1, 2018, 10 p.m.